Our problem's with your cousin. Bledar to Niko Bellic before fighting. 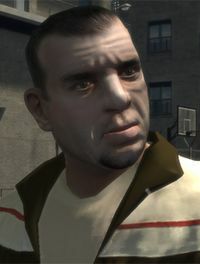 Bledar Morina is a minor character voiced by Gregory Korostishevsky in Grand Theft Auto IV. Morina is described as a money lender, blackmailer, thug, and fitness enthusiast. An Albanian gangster and part of the small Albanian Mafia, Bledar is a member of a small gang of thugs based in Broker. Along with Kalem, Bledar is led by Dardan Petrela, a loan-shark who extorts the lower members of society. One such man is Roman Bellic, who owes them gambling debts. Despite pressure from Russian mobster Vladimir Glebov to leave Roman alone, Dardan continues to harass him for the owed money by chasing him out of a poker game and eventually tracking him down to his taxi depot. Bledar smashes Roman's computer and Dardan threatens him with a knife, but Roman's cousin Niko Bellic breaks the party up and breaks Dardan's arm. Dardan and Bledar flee, but catch up with Roman later. Bledar later assaults Roman along with Kalem at a basketball court, but Niko arrives and beats them both to death. Afterwards Niko tracks down and kills Dardan. Affiliations: Linked to Russian and Eastern European criminals in Hove Beach. Even if the player didn't use weapons to fight Bledar, the game's status screen and the LCPD database confirmed that Bledar was in fact killed by Niko. This page was last modified on 26 October 2013, at 17:24.